We surely met them at least once in a lifetime – a condescending coworker. Such colleagues make life tough, and may even make you fall in situations when you question your sense of worth.Dealing with such person can be annoying, and hence, everyone avoids talking about them. 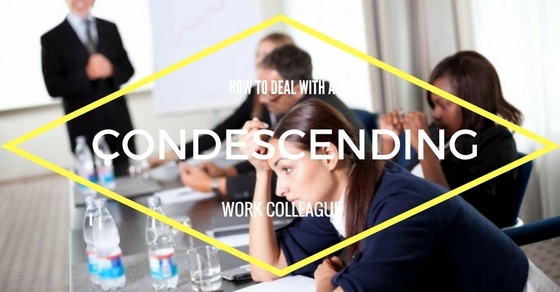 If a condescending coworker does not directly affect your work, then you may ignore him. But if such person deals with your daily work routine then you have to take an action in a way that it does not lead to any side effects. Here are some top ways for dealing with difficult people at the workplace and to live a stress-free and happy professional life. The following mentioned are few points on how to deal with the condescending coworker at workplace. Gestures such as yelling, commenting, and shouting are some very common symptoms of condescension. In the work area, people, however, opt for subtle ways of condescending, like talking behind the backs, cracking jokes related to your work, or avoiding you in meetings important for the organization. If your colleague shows any such gestures and behavioural act, then you can avoid engaging in such situation by discouraging gossips, creating jokes not related to the co-workers and creating a pleasing environment. There are few colleagues or difficult coworkers who you cannot avoid and who are also an important part of your team. There are very fewer co-workers who are a joy to work with. If you have colleagues who are arrogant, moody or demanding, then it is better to confront the same. But make sure that your confrontation does not make your colleague feel defensive. If a colleague makes an unpleasing comment which is not a part of its routine or regular nature, then the most effective way to deal with it is just to move on and stay calm. You must understand that only stupid people make bad comments and intentionally lashes out others at work. If it is only a secluded statement, then try to stay calm and move on with other things. If you and your colleague have decided to find a solution to a problem, then try to solve one issue at a time. It is a possibility that if you will highlight more than one issue, then your co-worker will take it personally and might react aggressively to the entire situation. Also, showcasing one mistake of your colleague will help you understand his behaviour and help you judge that whether he his is truly interested to find a solution to the problem or is just acting artificial. Sometimes; you can make a person realize about his condescension behaviour by transforming his wasteful comment or gesture into productive action. If your co-worker acts more knowledgeable and superior than you, then you must communicate with her or him in an effective way so that his feelings get transformed into productivity. You can ask questions related to that particular thing, or you may show him that since he has more knowledge he must do that particular task himself, and more. May, be your first reaction to any troubling situation would be a shock at the way you are being attended by your co-worker. At the office, you expect every person to act professionally, and it is almost difficult to handle clients or co-workers who act in a hostile or childish way. It is essential to take your time to let the shock or surprise wear off and then try to analyse the entire situation that is happening, and that has happened. Take a decision by your analysis and what has resulted in such behaviour of your colleague or team member. If the actions of your colleague make you suffer from a difficult situation at the workplace due to a condescending coworker, then you must talk to your senior or team in-charge about the overall situation. If possible, then try to gather some proof or real facts supporting the issues, like emails showcasing condescending behaviour or messages. The situation will be troubling, if the problems have occurred because of your senior’s condescending nature.In such case, you do not have any better option than to stay calm and try to focus more on your work and productivity. For dealing with difficult employees or senior, the other most effective way is to ask for a personal discussion or meeting to resolve the problems. If your intention is to not divulge what the entire discussion is all about, suggest something that sounds neutral, such as improving the communication flow in the workplace. Since here the problem is with the colleague so you may always ask your supervisor or boss to be a part of it and act as an intermediary between the two. The presence of a third person will also help smooth out the situation and avoids occurrence of any conflict. If someone’s condescending behaviour is affecting your potential tasks related to your profession, then you have to speak out, but without showing any real anger. Try responding courteously to the behaviour. You have to be polite and must pass on your message to that person indicating how you feel about disrespect and arrogance displayed by that individual. You can make polite statements to show that such behaviour is not acceptable by you and is truly very condescending. It is true that when a person behaves arrogantly, then it is difficult to show kindness towards him. But, if you do not want to feel guilty about any gesture, as showing negative attitude is not in your behaviour, and if you want to stay positive, then showing kindness is essential. It will not only help you stay positive but will also lend a helping hand in solving the problem. If your co-worker shows condescending behaviour towards you then try to resist the eagerness to retaliate. Breathe for a while, relax, think over the entire situation and analyse every aspect before moving on. You need to relax and stay calm and think of the entire situation that has happened and the reasons of why it has occurred. If the problem has occurred because of your mistake, then you must stay calm. If in case it is completely the fault of your colleague, then still you must think with a relaxed mind and try to answer the situation in a pleasing manner. If you are experiencing any problematic issue at work, specifically with a co-worker who bullies you personally, then you must take an action accordingly. If you do not take a move, then there are possibilities that the situation may get even more deteriorate and hence you have to act to overcome the entire stress of dealing the situation and not end up being a bully. You must try to let the offending colleague get aware of problems you are facing because of his behaviour. Whatever action you decide to take, do not let it wait for longer. The more time you will take to deal the troubling situation, the more stressed and disturbed you will become. If you have opted to take an action, then look for a suitable time and do not delay the process. It is wise to handle the problem before it becomes painful. While deciding on an action to take, make sure to stay emotionally controlled and do not let your anger conquer your mind. Remember, you have to revert to your colleague, but without leading to any harsh results. Despite its significance you must avoid engaging in troubling situations by maintaining your character. Do not complain to others on a regular basis as it can risk your personal reputation. It can raise questions such as why you are not able to fight with your enemies at work, or why you cannot win your battle. By regularly complaining about your co-worker you might display yourself as a troublemaker in the office.Also, it could make you be blamed for the occurrence of varied conflicts in the office. Do not let your grievances become public. Importantly, do not engage with problem creating persons in front of your boss, other co-workers, or your clients. Keeping your problems or issues with an individual would make it convenient for you to resolve the conflict or gel with that person once the issue has been resolved. May be you are over-reacting. Ask yourself that whether the situation is truly important to you and need your time. Forgetting about it will help you stay stress-free and away from unnecessary frustration. If the co-worker was once a good colleague of yours, then you may try approaching him or her first to solve the problem. Think on a positive note and act as if you are truly interested in solving the problem. You can begin the discussion on a soft note and apologize if you too have made some mistake in the past. It is a possibility that you may not agree with the person creating a problem. But even if you do not like him or her, you can still take a lesson from the entire event. You may use your discussion in a method to identify more about the viewpoint of your co-worker. There are almost negligible chances that you may make best friends, but you may use this entire situation to comprehend more about handling such situations. It will help you handle future problems with much ease. Non-verbal interaction is always vital, specifically when you intend to work through issues. When discussing such problems of condescension with your colleague, check out your body language and also what you intend to say. Avoid gestures such as rolling your eyes, pointing out fingers, crossing arms, standing while the person is sitting, and more. Sometimes individual are condescending without even realizing the fact that they are doing so. Try rising above your feelings and seek to comprehend your colleague’s perspective. You may invite your colleague for explaining what she or he was feeling or thinking when showcasing the condescending manner at the workplace. If you wish to be more considerate, then you may ask the colleague to tell you about his perspective on a specific situation. It is extremely essential that you must not take things personally as it will make you think that the person is attacking you. It may also trigger a fear of insecurity within you. When such situation occurs, you are not able to make fair, logical decisions. Might be the person is trying to provoke your negative side to make you feel in front of others colleagues or your boss. Do not forget your kindness and do not let negativity win over your positive character. So when dealing with difficult people at work, you must remember that condescending coworker behaviour is a reflection of their bad attitude and not yours. What others say and showcase is an explanation of their thoughts and character. You need to immune yourself against the viewpoints and behaviours of others so that you do not end up being a victim of wasteful sufferings. You cannot change the behaviours and personality of others, but you must learn to deal effectively with troubling people to reduce the suffering or impact on your personality, character and your work. Previous articleHow to Write a Retirement Letter to Coworkers?